Easy to assemble. Non-scratch finish. Adaptable to any size pole. Keep your patio cool and shaded when you support your umbrella with this beautiful International Caravan Seville umbrella stand. The stand is crafted from a durable resin compound that is resistant to weather and fading, and features an impressive weight of 33 pounds to keep your market umbrella secure. The rich and bold finish combines with the unique basket weave pattern to complete the elegant sophistication of this lovely stand. Dimensions 19.0 In. X 4.0 In. X 21.0 In. The weight of this stand is perfect. The height could be a little taller but overall works out well. The umbrella sways just a bit in windy times but the table holds it in place. It’s only about 10 inches that holds the umbrella so a shorter umbrella would work best. I think the only thing that could make this better is instead of a single screw to hold an umbrella in place, if there were several going around the stand to tighten. Perhaps that would keep it a bit more secure. Overall I’m very happy with the quality. There are several rings to choose from to adjust to the width of your umbrella, which is nice. The stand was packaged well. It was easy to assemble. It took all of 5 minutes. Good product. Decent price. The outer box appeared undamaged but the stand was badly chipped in about a 5 inch diameter and about 1/4" deep so that the inside resin material was visible. Not very durable for an outdoor item. I'm going to keep it and try to repair it myself just because it's too big a hassle to ship it back but I'm not impressed. the bronze one matches my patio table perfect. There is an insert to remove before you put the umbrella in. Did not notice at first and was concerned it was too small. Make sure to pull the plastic piece out. I got the bronze one and it happens to match the table and chairs I got (elsewhere). it holds the 9' umbrella but the umbrella is not super heavy. Keeps my lighted umbrella up nice and secure! Excellent. Has adapters to fit several size poles. Good weight. Color goes great with our deck stain; nice to have the color choices. Heavy and does not flop around. Purchased with umbrella. Works well and is heavy to keep umbrella in place during light winds. Used Fall and Winter outside of the patio table and no fading so far. Would purchase again. This is a great stand for my new patio umbrella. It is 33 pounds so very durable to hold the weight of the umbrella. Very attractive base style. Very happy with my choice. Another satisfied purchase. Fast delivery also. This umbrella stand was recommended for the umbrella that I bought. It fits and works just fine. very nice stand. Its just a good wt., in general.....it holds a 11 foot Umbrella with ease. GREAT BASE FOR WINDY DAYS. Purchased this as part of a new set for my deck. It is very sturdy without being so heavy that it is impossible to move. I was pleasantly surprised on the look of the umbrella stand. The umbrella stand is very sturdy and should hold up to our monsoon storms. Love the gray color and the design on it. The black color and rose design is very charming. The stand is very sturdy and holds the largest umbrella we could find. We get a lot of wind and never once worried about the umbrella blowing over. The stand was packed great for shipping. Sturdy and looks good too. This mount is exactly what we are looking for - it's heavy, easily assembled, and very attractive. It's weight will be sufficient for any heavy winds or storms and we will not worry about it moving or falling over. This stand fit perfectly with the Deluxe Solar Powered LED Lighted Patio Umbrella by Trademark Innovations that I also bought through Overstock. "Will this umbrella pole stand work for a table with a built in pole-guide hole diameter of 2 inches?" Yes it will work. That's the size that I have as well. "Can this be used without a table to steady it?" Yes, I bought two and they're fine with the fairly lightweight umbrellas I bought from this site as well. Only issue is that they're quite narrow so an umbrella with a thick pole wouldn't fit inside it. Guidance is only umbrellas with poles less than 1.9" diameter will fit. I use it with a heavy market umbrella with a wooden pole and it holds well as a stand alone. The bottom is a tight fit and I had to remove the plastic collar to get my umbrella in. "I just purchased the terra and it is too red... the bronze avaialble"
I'm sorry at this time the bronze is sold out. "will this fit a 2" wide umbrella pole?" 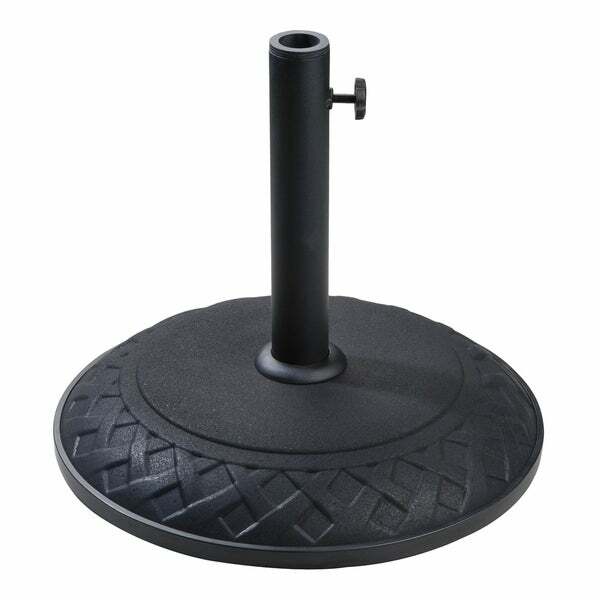 Use this stand with any umbrella pole up to 1.9 inches in diameter for the perfect fit every time. color, style, and over all look. I liked this color, design, and the low weight of this product. I liked the low price on this as well. I liked it because the information was detailed for weight, pole size, and other deminsions. I also liked the choice of color. Grey wiil disappear into the color of the deck floor. I thought the price was good for the weight.